Well organized. Easy to understand subject. The book name is a little silly, but it's true! This book helped me become a better mathematician. 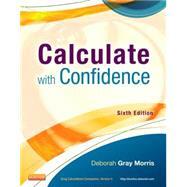 Calculate With Confidence: 4 out of 5 stars based on 2 user reviews.